Spriggina floundersi is the oldest fossil organism to be described with a "head". 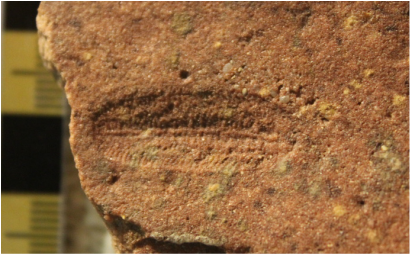 The fossil was originally described as a polychaete worm (commonly referred to as bristle worms), where subjective conclusions about its worm-like morphology were drawn from the fossil impressions. A current and objective morphological analysis is overdue. Spriggina shares some morphological characters with arthropods, such as a broadly 'segmented' body plan, possibly implying a relationship with that group. Body rather flat, head without external segmentation, with lateral extensions which give it roughly the same shape of a horseshoe, trunk consisting of a very gently tapering series of segments, numbering up to about 40. Parapodia with acicular setae. Pharynx well developed, not exserted in the present specimens. Like Spriggina floundersi, Spriggina ovata was originally interpreted as a polychaete worm (commonly referred to as bristle worms). S. ovata also shares some morphological characters with arthropods, possibly implying a phylogenetic affinity with that group. Elongate-oval polychaete worms. Prostomium arcuate, narrower than the broadest part of the body, which is a short distance behind it. The tapering postero-lateral processes of the prostomium possibly bear setae. Segments up to 50 or more, very short and broad, with parapodia apparently supported by bundles of long acicular setae. An axial groove is bounded on each segment by a pair of small ridges which are broadest and highest adaxially. On unflattened specimens the ridges terminate in a pair of small bosses adjacent to the parapodia, at least on the larger segments. A pair of small elongate ridges (such as teeth could form) occupy a near-axial position just behind the prostomium. On the best-preserved and on the flattened specimens, long setae are attached to the segments, between the axis and the parapodia. The setae are generally oriented in backward-curving groups and tend to obscure the segmentation.